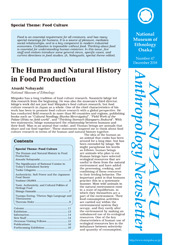 Minpaku Anthropology Newsletter is published semi-annually, in June and December. The Newsletter promotes a continuing exchange of information with 'Minpaku fellows' who have been attached to the Museum as visiting scholars from overseas. The Newsletter also provides a forum for communication with a wider academic and anthropological audience.